Macsome Audio Editor is a powerful audio editor on Mac OS X for free. 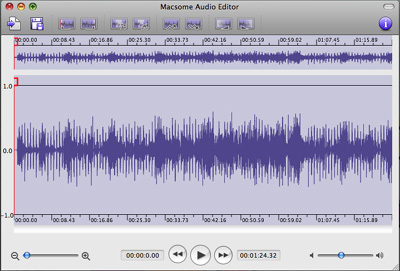 Macsome Audio Editor for Mac can quickly cut and trim audio, as well as split files. It works with compressed MP3 and AAC formats to edit without the quality loss caused by other editors. Get perfect quality audio when editing natively in the MP3, AAC formats. You may also Fade In or Fade Out an audio, adjust the volumn of an audio, and add ID Tags while saving MP3 or AAC file. You can use Macsome Audio Editor for Mac to make Ringtons for iPhone, or any other phone which support MP3 or AAC file as its ringtone. And you can also use it to remove any unwanted part or ads from audio files. If you want to edit an purchased audio book, Please use Macsome audiobook Converter to convert it to MP3 or AAC format. If you want to edit an DRM M4P you bought from iTunes Shop, you may need Macsome iTunes Converter to convert it to MP3 or AAC format. With Macsome Audio Recorder, you can just select part of an audio file. Then you can save to a file easily, or adjust volumn. Add fade in or fade out effects. You can also easily split a big files to small ones, and it supports precise splits. Qweas is providing links to Macsome Audio Editor for Mac 1.1.0 as a courtesy, and makes no representations regarding Macsome Audio Editor for Mac or any other applications or any information related thereto. Any questions, complaints or claims regarding this application Macsome Audio Editor for Mac 1.1.0 must be directed to the appropriate software vendor. You may click the publisher link of Macsome Audio Editor for Mac on the top of this page to get more details about the vendor.